The goal of this guide is to find the best looper pedal that’s right for you. Finding the best looper pedal is hard because there are so many different features across looper pedals. 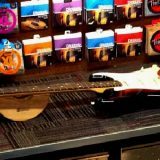 By the end of this guide you will have a strong understanding of looper pedals and you will be able to pick out the best looper pedal for you. What do you want in a looper pedal? Before you start looking at different options, it’s important to think about what you want in a looper pedal. Do you want one with enough flexibility that you could use it for a live show? Or do you want something simple for jamming and practicing at home? Do you want to be able to save your loops for future use? Or do you just want to be able to create loops on the fly and don’t need complicated features? Value: how much do you want to spend on a looper pedal? How much is a looper pedal worth to you? Do you want to get a great looper pedal now or upgrade later on? Simplicity: do you want an easy-to-use pedal without all the bells and whistles? Or are you happy for a more complicated pedal that gives you more features? Flexibility: do you need to create multiple loops, switch between them on the fly or use MIDI sync to match your looper with other time based pedals? Live usage: do you plan on using the pedal during live performances? If so, you need to make sure the pedal is easy to use without having to bend down and change settings with your hands. 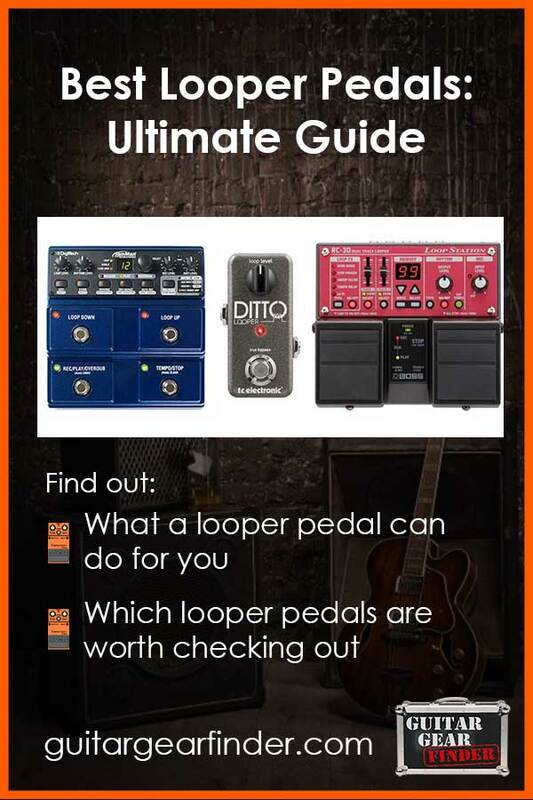 Even if you’re not sure on some of these questions, by the end of the guide you will have a strong understanding of what’s important to you in a looper pedal. The looper pedal on the left is the Ditto by TC Electronic. It’s an incredibly simple looper under $100. The looper on the right is the RC-300 by BOSS. It should be no surprise that it’s an incredibly feature filled looper with almost every possible feature you could want in a looper. At around $550 on Amazon, it’s on the high end of looper pedals. The two above pedals are both loopers, but the two couldn’t be further apart in what they’re capable of. There are countless pedals in-between these two extremes, so let’s go through important looper features so you can decide what you want in a looper pedal. Let’s compare this to a looper with two footswitches. Simply adding one more footswitch gives you far more control over your loops. Instead of tap dancing on one footswitch and trying to remember whether you need to do a double-tap or long press for a certain function, the functions are spread over two pedals. This means you have a lot more control over your loops and are able to do more. Jump up to a looper such as the RC-300 (in the image earlier) and the extra footswitches give you far more control and flexibility. The RC-300 has 8 footswitches and an expression pedal. A looper with that many footswitches means you can achieve far more and experience less limitations. To give you an idea, if you wanted to record a slow 12 bar blues shuffle, it might take you around 30 seconds to play the 12 bars depending on the tempo. If you wanted to record two repeats of the shuffle in one loop, you would want a loop time of around 60 seconds. 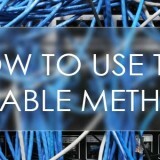 This is only important if you run a stereo rig. If you run a mono rig, you can skip to the next feature. Many guitarists like to place their looper after all of their effect pedals so the looper can record those effects as well. If your looper is mono, this means all of your effects will go through the mono looper. So if you run a stereo rig, make sure you get a stereo looper or you’re going to be very limited in where you position your looper pedal in your chain. If you’re a solo guitarist, you might want to experiment with multiple inputs so you can create more complex loops. For example you might use a microphone input into the looper to add a tambourine or shaker into the loop or you might add some vocals. You might want to also connect something like a foot stomp box (not a guitar pedal) to add some bass kick sounds to your loop. Multiple inputs are worth considering if you’re a live guitarist looking at creating more complex loops. 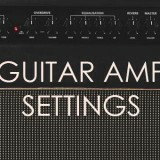 If you only play electric guitar, unless you want to experiment with different inputs, you won’t need to worry about this feature. Some looper pedals have in-built effects such as ‘reverse’, ‘half speed’, ‘lo-fi filter’. These are effects that can be applied to the loop without affecting your regular tone. For example the reverse effect takes the loop and plays it backwards. While some of these effects can be fun and can help you come up with creative ideas, if you’re like me you will play with them a few times then never touch them again. Some effects can sound outright gimmicky. I recommend ignoring inbuilt effects when you choose a looper pedal right for you as you’re unlikely to use them at all. Some pedals will erase the loop as soon as it’s disconnected while others give you the ability to save your loops. Some pedals also have the ability to save your loops to an SD card which can then be transferred to a computer (or via USB). Saving your loops can be handy if you’re songwriting or you want to have loops ready to go for a live performance. This also means that some loopers are able to import backing tracks or any other audio files for you to play around with. Some looper pedals are able to sync your looper with your other time-based gear via MIDI sync. For example, if you have a BeatBuddy or other drum machine, you could ensure that your loop and the drum loop are both synced up. If you don’t have any other gear that uses MIDI sync, this isn’t a feature you should need to worry about. If you read the above features and felt like you just want something simple to jam along with, then I recommend the Ditto by TC Electronic. It’s incredibly popular due to its quality and simplicity. I review the Ditto thoroughly here so check it out for full details. While I did mention earlier that one footswitch can be limiting, for many at-home guitarists it’s not a problem. If you just want to be able to record an idea and play around with simple loops, then the Ditto will get the job done. It’s also a very affordable pedal so you can get a feel for loopers without having to spend a significant amount of money. A good alternative to the Ditto is the BOSS RC-1. The RC-1 costs the same as the ditto, but packs in a couple more features that the Ditto lacks. If you’re looking for a simple looper, you may find you prefer the RC-1 over the Ditto. Find out more about the RC-1 in my comparison of the BOSS Loop Station pedals here. 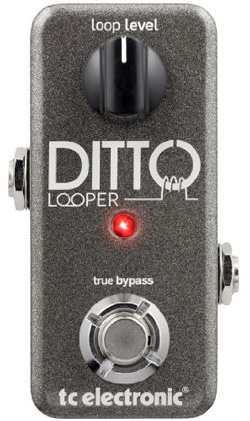 Check out the Ditto Looper here for price and more information. If you like the idea of the Ditto but want slightly more features, check out the Ditto X2 or the Ditto X4. 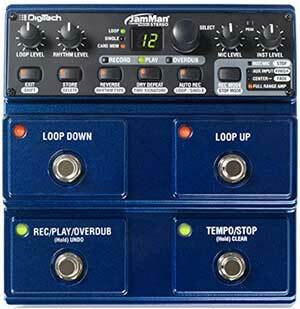 This was a hard decision between the BOSS RC-30 and the DigiTech JamMan Stereo. I’m picking the JamMan here because it offers slightly more flexibility at a lower price. I’ve reviewed the RC-30 here if you want to find out about it. The JamMan is a big step up from the Ditto above and that means you have a lot more flexibility in the type of loops you can create and what you do with those loops. The four footswitch setup gives you far more control and when you consider that you can connect an external footswitch for more control, it’s a massive improvement from all the one or two footswitch loopers. The RC-30 was easy to use (it has two footswitches), but four footswitches just makes everything so much easier to control. For most guitarists, the JamMan Stereo packs in plenty of features and gives enough flexibility for home or live usage. It’s a good middle range looper that doesn’t suffer from lack of control like one or two footswitch loopers suffer from. Check out the full details and price of the Jam Man Stereo here. 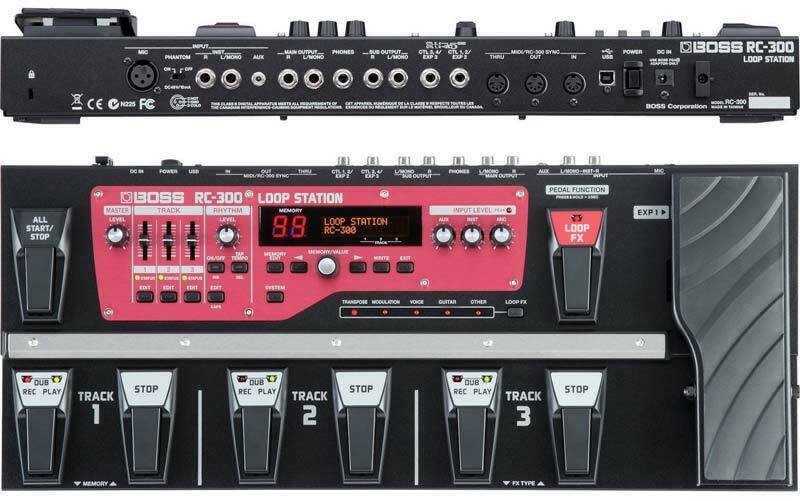 I’ve played quite a few looper pedals over the years and one has always stood out in my mind: the RC-300 Loop Station by BOSS. While some guitarists prefer other large looper pedals such as the Boomerang, I never felt like any of them were on the same level as the RC-300. The Loop Station range by BOSS are some of the most popular looper pedals available today. The RC-300 is the top-of-the-range looper. To see how it compares to the other looper pedals in their range, check out my Comparison of the BOSS Loop Station pedals here. You may find you prefer one of those pedals over all of the suggestions here. The RC-300 offers a serious number of options for inputs/outputs, expression pedals, phantom power, and MIDI. The 8 footswitches (and the ability to add external footswitches) means you have plenty of control over the three loop tracks you can set up. You can see that each loop track has two footswitches – a record/play/dub switch and a stop switch. This gives you freedom, unlike most other looper pedals. You can start and stop individual loops as you like – which is great for verse/chorus type loops. The ability to save loops to the pedal’s memory and adjust individual track volume means you can tweak each loop as you like. Check out the current price and full details of the RC-300 here. There are plenty of other looper pedals I haven’t covered in this guide. 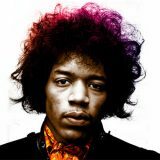 Many are worth talking about however the three I’ve covered above should suit the majority of guitarists. One out of three of those pedals will appeal to you. One alternative I’ll mention is the looper functions built into many multi-effects pedals. Pedals such as the Line 6 HD500X or the Zoom G5 have decent looper functions. Some of those loopers can be superior to many standalone loopers. There are seven footswitches to control the looper (with another footswitch to select the looper). One footswitch for record/overdub, another for play/stop, another for undo, two for effects (reverse, 1/2 speed), one for play once and another for pre/post effects (switches the position of the looper in the signal chain. That’s far more control than many standalone loopers. Instead of trying to double-tap footswitches, with a looper such as the one built into the HD500X, the functions are spread out. The downside to loopers built into multi-effects pedals is that they often have far lower recording times compared to standalone loopers. The HD500X creates loops up to 60 seconds and the Zoom G5 up to 60 seconds. That’s still plenty of time for most guitarists, but far short of other pedals that boast times in minutes or even hours! Check out my review of the Line 6 HD500X and the Zoom G5 for more information on the inbuilt loopers. See the toggle switch at the top right? That switches between delay and looper modes. Other pedals sometimes have ‘looper’ as one of the delay types. That means when you switch over to looper mode, you lose your delay effects. Keep this in mind with this alternative. If you want to have both a delay and a looper, you might want separate pedals. 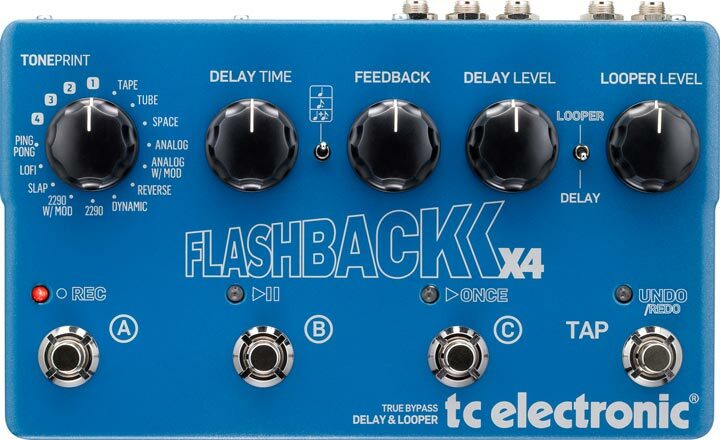 Check out my Flashback X4 review for more information on the inbuilt looper. Once you find a looper pedal that suits your needs, head on over to my Looper Pedal Basics Lesson. I cover a few simple exercises to get you used to create loops. A handy downloadable PDF contains all the TAB and instructions for the exercises.